So after a somewhat mixed start in July, did things go any better during August? We had a family holiday down in Cornwall in early August so betting was limited to either side of our week away. Trying to carve out an hour each day to place horse bets was always going to be a challenge with the family in tow! Nevertheless, here are the results for what was, ultimately, 17 days of bets. As you can see from the results table above, things worked out rather well! Our starting bank for the month was £479.71 after July’s small loss, but by the end of August, I’d managed to bank an impressive profit of £227.95, elevating our balance to a closing value of £706.66. This translates into a 47.5% return on my bank for the month and 39.6% since we began in July. The chart shows that we built some great momentum in August, particularly in the middle of the month where we enjoyed a number of consecutive days with good profits. The overall return of 47.5% (before deducting the OddsMonkey subscription) is even more impressive when you consider the second half of August was fairly uneventful bar one decent day on the 29th. There were a number of losing days. Again, we should expect to see most of our bets lose – we are just trying to land one or two wins or place combinations. When these come in, they significantly offset those losing bets. It just goes to show that returns are still possible – more than 50% of my bets lost this month, yet the returns were substantial. Well done on achieving some great results. Like you I’m doing £5 eachway bets across 7-8 of the main bookmakers (Bet 365, Ladbrokes, William Hill etc). From what I gather the restrictions are more likely to happen sooner on some of the less established, internet only bookmakers. Question for you. 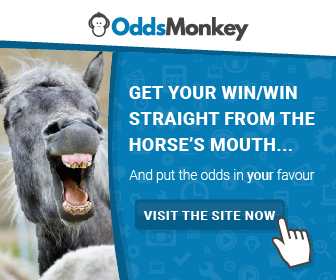 Are you placing bets in the same browser as OddsMonkey? That might trigger things on the bookmaker side of things. I personally have OddsMonkey on my PC but actually place bets via the mobile apps on my phone. Not sure if that makes a difference but I read another article that offered some tips and tricks as to how to block the small bit of code that the bookmakers may use to track your IP address – it was called IE Snare I’d something. I’ll see if I can find a link. I’m planning to up stakes at the end of the month. I figure if the likes of TheFireStarter is up to £45 stakes there is enough wriggle room :-). September is looking even better than August right now (I’ll post results next week). Who really knows how long this can last so I think I’ll try and make hay while the sun shines – always keeping to 1% risk though to ride out the variance.